TippNet Review 2019: Is TippNet a Good Hosting? TippNet is a website hosting provider based in Serbia. The vendor specializes in the provision of shared and cloud web hosting solutions to small and medium-sized businesses in Serbia and other countries across the globe. TippNet is a web hosting vendor that was started in 1996. The veteran hosting company was the first ISP in Subotica, Serbia. The company offers shared and cloud hosting solutions to small and medium-sized businesses. It is one of the top ten largest web hosting companies in Serbia by market share. TippNet also provides an array of other internet services including domain name registration services, sale and development of software, and website creation among others. Its website is available in Serbian and Hungarian. TippNet uses robust Intel quad-core processors ensuring that its servers have high performance and reliability. The data center is connected to a fast backbone network and has powerful air conditioning systems as part of the vendor’s attempt to provide the best conditions for its servers to deliver reliable hosting solutions. The firm’s shared web hosting solution is available in four packages: Classic, Advanced, Pro, and Premium. Classic is the cheapest shared hosting package. It comes with 100MB HDD disk space, two domains, five emails, one FTP account, and 50GB monthly bandwidth. The premium shared hosting package includes 20GB HDD disk space, unlimited domains, unlimited emails, 100 FTP accounts, and unlimited bandwidth. TippNet customers are somewhat satisfied with its availability. All the same, the vendor does not commit itself to an uptime network guarantee. The hosting provider offers daily backup services for all its hosting packages. TippNet provides a free Let’s Encrypt SSL certificate upon receiving a request from a client. Available certificates include GeoTrust, RapidSSL, and WildCard certificate. Although TippNet’s website looks typical and is pretty basic, the design and organization allows users to navigate it with considerable ease. TippNet’s hosting solutions are available at pretty standard prices. However, given the apparent limitations included, the seemingly reasonable prices could cost a user a great deal over time. The hosting company does not offer a free trial and has no refund policy or uptime network guarantee. 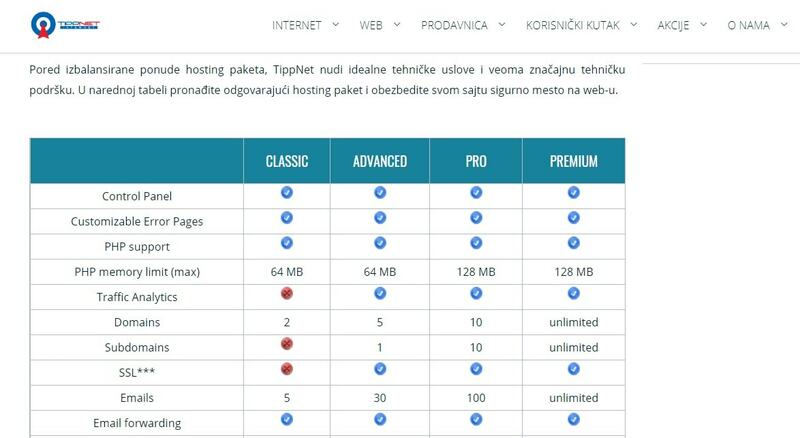 The vendor lists the prices of its hosting plans in Serbian dinar. Its billing cycles are pretty flexible; users can commit to either quarterly, semi annual, or annual payment subscriptions. You can contact TippNet’s technical support team via telephone, email and ticketing system, but there is no live chat support. The vendor’s claim to offer round the clock support is questionable, given that I sent them an email and never heard back from them. TippNet has not set up a knowledge base on its website, either. While TippNet is a veteran hosting company in Serbia with a noteworthy market share of the country’s hosting industry, the vendor has over the years made light of the need to provide excellent support powered by a competent and highly-trained staff. All the same, for businesses that are not too dependant on help from the support team, the vendor does have ideal hosting solutions. Wondering how TippNet stacks up against other Web Hosting companies? Enter any other Web Hosting company and we will give you a side-by-side comparison.